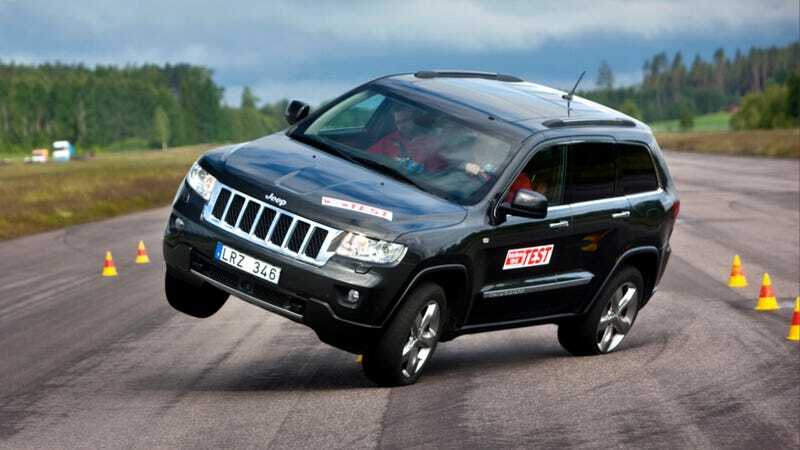 Despite top notch safety ratings from the Insurance Institute for Highway Safety, a Swedish car magazine found the 2012 Jeep Grand Cherokee to be somewhat lacking in the rollover safety department. In the famous "moose test" — named because it simulates swerving to avoid hitting a moose or elk or child or something — the Jeep Grand Cherokee stood up on two wheels when it swerved at less than 40 miles per hour. "The Jeep Grand Cherokee isn't at all performing as a modern car should," said Teknikens Värld's Linus Pröjtz in the mag's video about the test. "The car doesn't at all handle the loads built up in the chassis. The car is close to falling over." Chrysler Group is calling foul on the test. Jeep engineers maintain that the SUV was overloaded during the test, and that when the test was repeated using a load weight consistent with what it's rated for, the driver couldn't get the car to tip up on its side again. Teknikens Värld had five adults in the passenger area, plus an unspecified number of sandbags in the back, presumably to simulate luggage. According to the Jeep Grand Cherokee's specification sheet, the Overland model — the one tested in Sweden — can carry a payload of just under 1,600 pounds. That's equivalent to five 200-lb. adults and 580 pounds of luggage. Those are stocky adults and a lot of luggage. The test car didn't look like it was packed to the gills. We reached out to Teknikens Värld for more information about how they load vehicles for the moose test, but we haven't heard back yet. They also tested the Volkswagen Touareg, Volvo XC90, and BMW X5 in similar test scenarios, but none of those SUVs had any problems at 43.5 mph. As tested, the Grand Cherokee nearly tipped at 39.5 mph. Advised of this event by the magazine, Chrysler Group engineers made numerous attempts to reproduce the wheel-lift in a properly loaded vehicle. Extensive testing produced no such result. A subsequent evaluation was conducted by the magazine July 8 in Sweden and witnessed by Chrysler Group engineers. Three vehicles performed 11 runs on a course prepared by the magazine. None reproduced the original event. The uncharacteristic result was obtained using a vehicle loaded beyond its weight specifications. The Grand Cherokee's weight limitations are clearly stated on the vehicle and in the owner's manual. Also, the extreme maneuver performed by the magazine is not certified by any regulatory agency, nor is it used to establish any sanctioned safety ratings. Chrysler Group takes seriously any safety concerns and engineers are examining the event to better understand the magazine's claims. A "Top Safety Pick" of the U.S. Insurance Institute for Highway Safety, the 2012 Grand Cherokee is an award-winning SUV that features Electronic Stability Control and Electronic Roll Mitigation as standard equipment. It meets or exceeds all government safety mandates and its outstanding performance has made it the most awarded SUV in history. UPDATE: Teknikens Värld is on Sweden time, so it took a while for them to respond, but they did get back to us regarding Chrysler Group's claim that they overloaded the test vehicle. Web Editor Mattias Rabe said that they followed the vehicle's Swedish registration cargo weight specs to the T when they loaded it with five people and a number of sandbags tied down in the luggage compartment (which he couldn't remember the weight of off the top of his head). The tires were inflated to the pressure recommended by the owners manual. "We did the exact same procedure [for the moose test] as we have done it since the 1970s," he said in an email. "The previous generation Grand Cherokee was moose tested in 2005 and that generation did pass the test without any problems." Rabe said that the test has outed other potentially unstable vehicles, and that in the past, manufacturers have realized the error of their ways and made changes. In 1997, they rolled a Mercedes A-Class performing the moose test. In 2007, a Toyota Hilux with 16-inch wheels claimed the dubious honor. Skoda found that they had miscalculated tire pressure and load capacity after Teknikens Värld rolled a Skoda Superb in 2010.